Armed pro-Russian activists have stormed the headquarters of Ukraine’s navy in the Crimean city of Sevastopol. 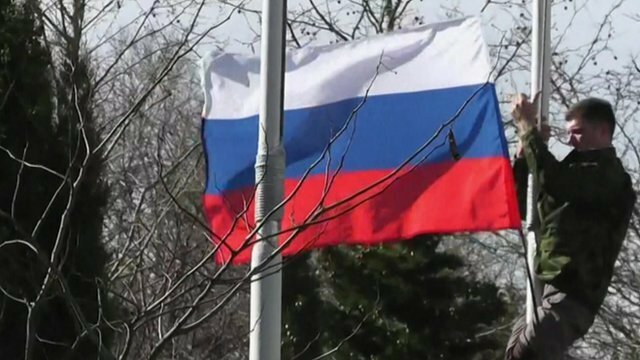 Several Ukrainian servicemen have left, the Russia flag is flying and there are reports that Ukrainian navy chief Serhiy Hayduk has been detained. It comes a day after Crimean leaders signed a treaty with Russia absorbing the peninsula into Russia. Sunday’s disputed referendum, which officials say backed splitting from Ukraine, has been widely condemned. Crimean and Russian officials say the vote showed overwhelming public support for joining Russia, with 97% of voters in favor. But the West and the Ukrainian government in Kiev say the referendum – organized in two weeks and boycotted by many of Crimea’s Ukrainian and Tatar minorities – was illegal, and the results will not be recognized. On Wednesday, Russia’s constitutional court approved the treaty as legal. Ukrainian Defense Minister Ihor Tenyukh has reportedly been ordered to head to Crimea amid the rising tensions. Later, there were reports that Ukrainian navy chief Serhiy Hayduk had been detained and taken away from the base by the Russian Federal Security Service (FSB). A number of Ukrainian servicemen were seen leaving the base. There have been no reports of clashes or shots being fired. “They are unarmed and no shots have been fired from our side. The officers have barricaded themselves inside the building,” he said. He said even though Kiev had authorized the military to use force in Crimea in self-defense “we are not doing so and will not do so”. Reports are also emerging of a similar incident at a Ukrainian navy base in Novo-Ozyorne, western Crimea. Ukrainian defense ministry spokesman Vladyslav Seleznev said a tractor had rammed the gates of the compound and pro-Russians had entered the base.